December 10, 2013: On the occasion of its third annual Anticorruption Day Celebrations, the Asian Development Bank Governance and Public Management Community of Practice planned week-long events to raise awareness about the importance of integrity and anti-corruption amongst staff and stakeholders. The events culminated with the main event on December 9 at the ADB headquarter in Manila, Philippines. 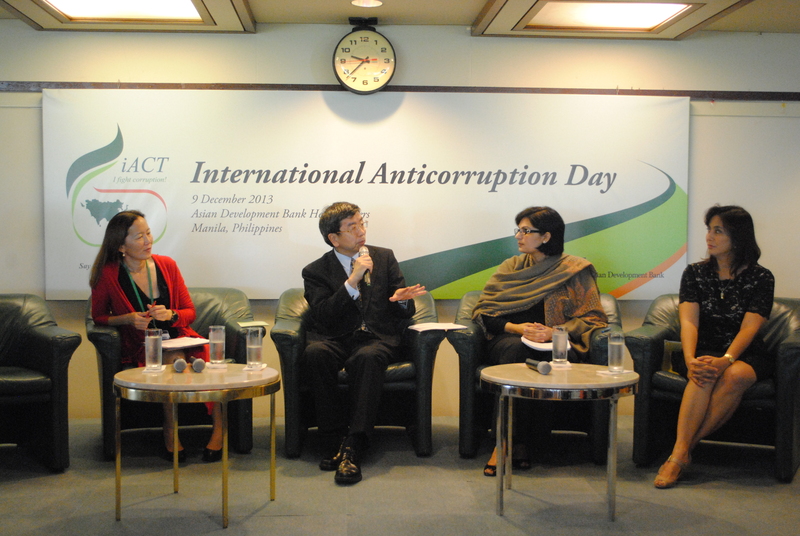 The event was focused on ADB’s internal anticorruption campaign, “iACT: I fight corruption”. Our President, Dr Sania Nishtar was invited as the keynote speaker along with President of the Asian Development Bank, Takehiko Nakao and Philippine Congresswoman Leni Robredo. The text of her speech can be viewed here. December 10, 2013: A regional meeting on “Accelerating progress towards universal health coverage: global experiences and lessons for the Eastern Mediterranean Region” was hosted by the WHO Regional Office in Dubai, United Arab Emirates, from 5 to 7 December 2013. The Conference aimed to share international experiences with regional policy- and decision-makers to assist them in devising a clear vision for health system reform to achieve the goal of Universal Health Coverage. At the occasion, our President, Dr. Sania Nishtar gave a plenary talk on “Innovations in health financing for Universal Health Coverage”. December 06, 2013: In Pakistan, women from lower socio-economic strata are amongst the most vulnerable in terms of foregone care and medical impoverishment when catastrophic healthcare costs are involved. This month, Heartfile’s recent report on The Right to Reproductive Healthcare in Pakistan: The Voice of Women assesses financial access barriers through a qualitative lens, highlighting their suffering. The report authored by Katrina A. Ronis & Saba Amjad et al. can be Read here.